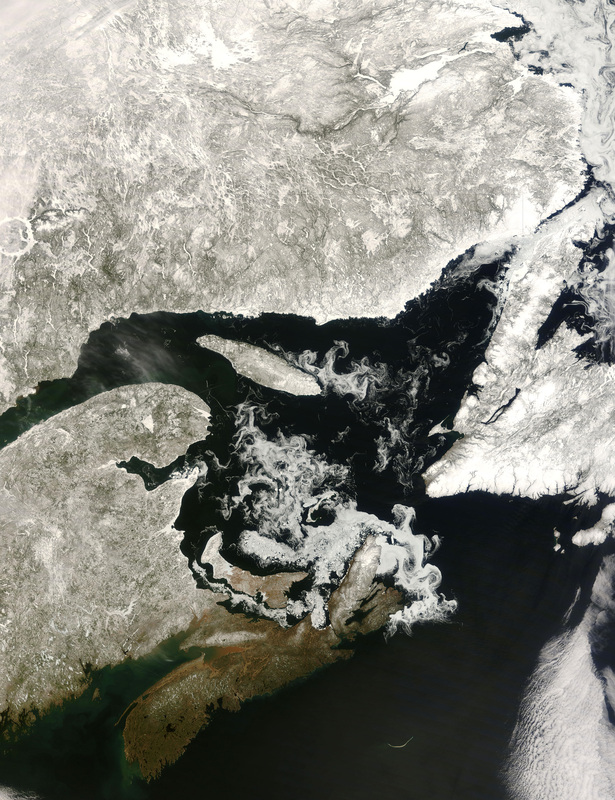 Winter had started to release its grip on the Gulf of St. Lawrence when the Moderate Resolution Imaging Spectroradiometer (MODIS) on NASA’s Terra satellite captured this photo-like image on April 7, 2008. Swirling clouds over chunky fields of sea ice Â­provide a stark contrast to the deep black water of the gulf. The surrounding winter-brown landscape is still coated in white snow and ice except for southern Nova Scotia, which is starting to flush green with early spring foliage. The scene would have been much different, more uniformly white, if taken a month or two earlier. In the deep of winter, sea ice claims most of the gulf, while snow covers the land. Located in eastern Canada, the Gulf of St. Lawrence owes many of its unique characteristics to its geography. Sea water flows into and out of the gulf through only two channels. Currents and tides sweep cold, Arctic seawater through the narrow Strait of Belle Isle in the north. In the south, the wider Cabot Strait admits warmer water from the Atlantic Gulf Stream. With no other outlet to the Atlantic, the Gulf of St. Lawrence is relatively isolated. Fresh water from numerous rivers mingles with salty sea water, creating the brackish water found in estuaries. The largest river to feed the gulf is the St. Lawrence River, which carries water from the Great Lakes into the Atlantic. The flow of fresh water from the river drives the circulation of water through the gulf. Seasonal swings in the flow of fresh water and ocean currents and tides changes the makeup of the Gulf of St. Lawrence. As this image shows, spring releases the water from its winter covering of sea ice. The chilled surface water mixes with deeper, nutrient-rich water, bringing nutrients to the surface. As spring progresses, the snow will melt and the flow of fresh water in the gulf from rivers will increase, and this too brings fresh nutrients like nitrogen and phosphorous into the surface waters. 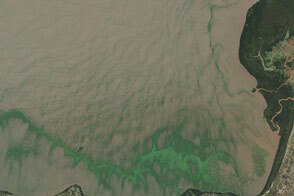 The infusion of nutrients along with increased sunlight spurs spectacular springtime blooms of phytoplankton, tiny plant-like organisms that grow near the surface of the ocean. As spring progresses, phytoplankton use all of the nutrients and die away. The fresh water flowing into the gulf heats in the long days, and soon, the cold winter water is buried under a layer of warm surface water. Eventually, winter returns and cools the water, which sinks to make way for another layer of warm water the next spring. Located in eastern Canada, the Gulf of St. Lawrence owes many of its unique characteristics to its geography. Sea water flows into and out of the gulf through only two channels. Currents and tides sweep cold, Arctic seawater through the narrow Strait of Belle Isle in the north. 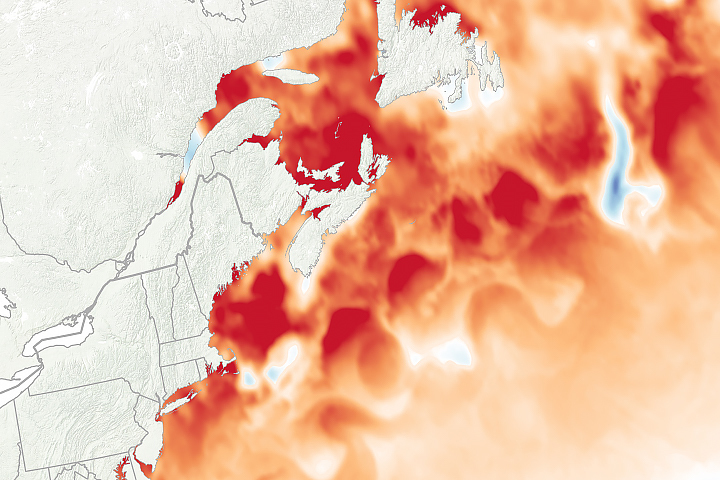 In the south, the wider Cabot Strait admits warmer water from the Atlantic Gulf Stream. With no other outlet to the Atlantic, the Gulf of St. Lawrence is relatively isolated. Fisheries and Oceans Canada. (2007, January 19). The Gulf of St. Lawrence—a unique ecosystem. Accessed April 11, 2008.